VHT Wrinkle Plus combines strong colors with a deep rich texture for a custom look. It is temperature resistant to 350°F (177°C) and is ideal for adding a touch of personal styling to almost any metal surface. VHT Wrinkle Plus™ resists color fading, grease, degreasers and severe weather conditions. This tough durable finish is extremely resistant to rust, corrosion, chipping and cracking. 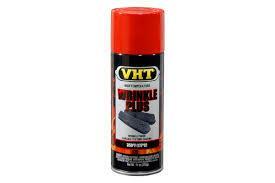 - VHT Wrinkle Plus only attains its unique properties after correct curing.